Be Updated with your Child’s Locations Through Android!! Every parent worries about their children’s activities and safety; whether it is about child arriving late at home from school or fear of kids going astray. Due to continuous increase in crime rate, parents want to get reassurance of knowing where their kids are, whether they are safe, have they reached their destinations or are they at the location, they said they would be. Android Smartphone can help you track your child’s activity remotely. There are various apps available for your help. By using GPS, your Android phones will track your child and assure you of their safety. How does Android GPS Tracking help? Android GPS Tracking Application will help you to control your children’s activities remotely from your smart phones. You will be able to track your kids’ locations and be aware about their whereabouts. The application also allows you to view your child’s driving directions. Not only will you be able to view their current location and where they have been but also set up a “Geo Fence” for your child’s device. You will receive an alert if your kid is going out of the specified area. The GPS tracking app works in a stealth mode without letting your child know they are getting tracked- this is especially for those children who rebel against their freedom, bt are yet vulnerable. It’s difficult for parents to keep a watch on their children all the time. Android GPS tracking apps will thus give you peace of mind and help you to keep a track of their activities even while you are in office. It will also allow you to keep a control on your teenage kids by knowing where they go and hang out. This becomes important when they start driving. Keeping children safe and secure is the priority for every parents and Android GPS tracking apps can help you do this easily. Today many parents are using these apps for tracking their children. The GPS tracking apps use advanced technology and are gradually gaining popularity. 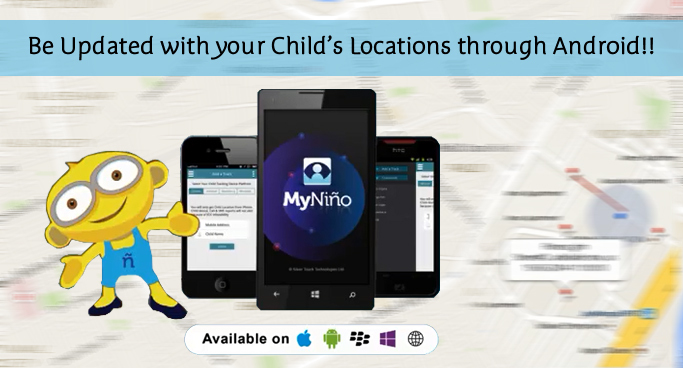 MyNiño is one such child tracking application developed by Silver Touch Technologies Ltd. It is an ingenious multi–platform app having two versions i.e. Parent Application and Child Application. The Child App is for installing in the Child Smartphone that needs to be tracked, while the Parent App is for the Parent to Track. MyNiño is available on iPhone, Windows Phone. It consists of all the features to help you track your children. Are you a parent and looking for an innovative and feature – packed Child Tracking Application for your smart phones? Get in touch with us to know how MyNiño can be helpful to you!! To get hands-on experience of MyNiño, you can even download its free trial version for 30 days.